Dr. Olsen began his dental career in 1985 in northern Utah. He completed his undergraduate studies at Utah State University prior to receiving his degree of Doctorate of Dental Science from Northwestern University. After visiting his sister in Davidson, he fell in love with the area. He thought this would be a great place to start a new practice. So, in 2005, he and his lovely wife, Missy moved to Huntersville to begin another chapter of their life. He is an active member of The American Dental Association and The North Carolina Dental Association. His membership in these organizations, as well as his completion of several advanced cosmetic dentistry courses, has allowed him to remain current on the most beneficial and cutting edge dental treatments. 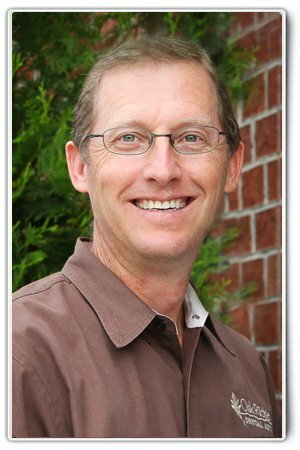 Dr. Olsen is well known by his patients for being a kind and considerate dentist. He cares for them with respect for their individual needs and concerns. Throughout his 25 years in the dental field, Dr. Olsen has developed a reputation for paying close attention to detail and providing patients with the highest quality care. His gentle and calm disposition ensures patients have an excellent experience when they visit the dental office.